We’ve been lucky this winter with mostly mild weather. Sure, Rochester had a huge snowstorm last week, a storm that brought 19 inches to my yard and the typically hearty community to its knees for about 24 hours. So true cold-weather running has been pretty much non-existent for me this season. That said, there are always a few thoughts that zip through my mind when I hit the pavement amid snow and subzero temps. 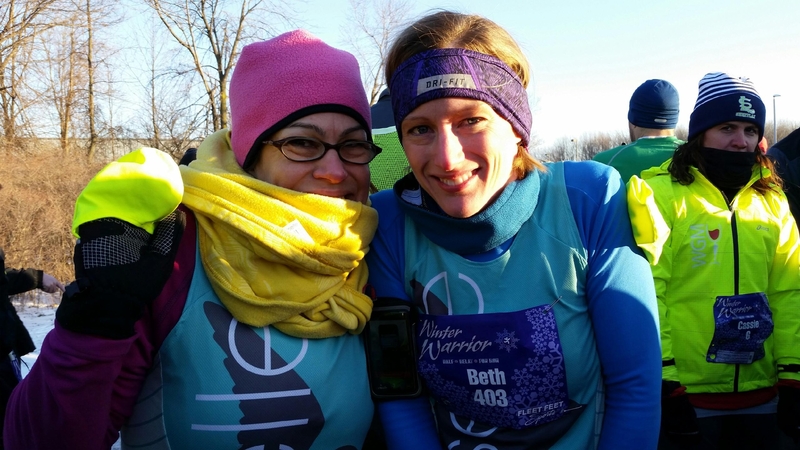 It was bitter cold when pal Beth and I ran a winter half-marathon last year. Subzero temps had us bundle up and we were still darn chilly by the time we finished. Did my water bottle just freeze? Why yes, I am now carrying a 5-pound ice weight. None of what I am wearing matches, but it’s all bright neon. Notice me, oncoming cars. I’m a beacon of color. Aim for the bald patches in the road. Anything not to wear spikes when not snow/trail running. Perhaps the treadmill would’ve been a good idea today. I love winter running, actually. In part because I feel like a badass for braving elements that send many inside for a warmer workout. Sometimes a 5-mile tromp through fresh snow equals the effort for a 10-miler on a crisp fall day. Sometimes you find yourself on a busy road’s shoulder because the icy, unplowed sidewalk is downright treacherous. Occasionally, you have to jump into a snowdrift and out of the path of an oncoming snowplow. No matter the obstacle, I always feel great once I am done. It’s always well worth the bitter cold effort. What runs through your mind when you run in the snow? Sometimes life doesn’t work out the way you want it to or think it will. Last Sunday was going to be the day I ran my first marathon. I didn’t know what my time would be, or how my body would feel after it, or if I’d love the experience or hate it. But I knew I’d finish. Before I get into the details of what happened Sunday, a little background. I started running in April, when I decided I wanted to run a half marathon in September. When I made that decision, I had no bigger plans than just running the half marathon, but it quickly became apparent once I started to train that I would want to run a full marathon at some point. My thinking at the time was that I’d do another half marathon this spring, then do my first full in October. Then I ran the half marathon, and it was perfect. I ran the entire way with Chick Vic, met my goal of under two hours and helped her beat her PR by five minutes. I felt so good that I wanted to start training for a full marathon right away. After one recovery week, I began a 20-week marathon training program that put the date for my first full in mid-February. Perfect time to go down to Florida and run a race. But just to be safe, I decided to find a backup race in case flying to Florida wouldn’t work out. And that’s how I ended up attempting my first full marathon in upstate New York in the middle of February. My training went very well, for the most part. I did Hal Higdon’s Novice 2 program, modified slightly to fit my schedule (and extended two weeks to add a second 20-mile run). I ran outdoors as much as possible (on the weekends and when my parents were in town and could watch my daughters), experiencing some truly uncomfortable conditions that I hoped would prepare me for whatever weather awaited on race day. In early November, I did a 14-mile training run that included a 1:52:26 half marathon, more than six minutes faster than the race I had run in September. On my first 18-mile run, I was able to do the final six miles at an 8:19 per mile pace. Neither of my 20-mile runs felt great, but I was a lot fresher after the second one than the first one, which I considered a good sign. The only race I did during training was a hilly 7.5-miler on New Year’s Day in frigid weather, and I felt great after finishing in 1:07:22. The Hudson Mohawk Road Racers Club Winter Marathon was an out-of-town race for me, but the logistics set up perfectly. On Saturday, I took the train to Schenectady, where I stayed with my wife’s aunt and uncle. They took me for a pasta dinner that night and had everything I’d need to get ready for the race. As a bonus, my wife’s uncle is not just a former marathoner, but a former sub-3-hour marathoner who ran Boston eight times. It was nice to be able to talk about some of his race experiences as I prepared for my first one. Sunday morning I had a banana and a bagel with peanut butter for breakfast (I also had a gel half an hour before the race and carried four on the course with me), got all layered up for the 20-degree weather that was supposed to feel colder with the wind and then they took me to the University of Albany’s athletic campus, the site of the race’s roughly 5.5-mile loop course. My parents, who live in western Massachusetts, drove to Albany Sunday morning and met me before the race to cheer me on and then drive me back to Rochester. All smiles with my parents before the race. As the start time of 10 a.m. drew closer, everything was going according to script, and that would continue to be the case for about the next two hours. I had three goals for my first marathon. First, obviously, was to finish. Second was to finish in under 4 hours, 22 minutes, a 10-minute pace. Third was to finish in under four hours. I know you’re not supposed to worry about time for your first marathon, and I know you’re really not supposed to go out too fast. My plan was to set a pace that would give me a shot at a four-hour marathon. If I was feeling good, I’d go for it. If I wasn’t feeling good, I’d slow down and just do what I could. The first half of the race went pretty much according to plan. I let the adrenaline get to me a bit in the first mile and ran an 8:23, but I slowed down right away and was at 9:24 and 9:33 the next two miles, then I accidentally slowed down even more and did the fourth mile in 9:59. After that, I settled into a groove and started clicking off 9:00-9:30 miles: 9:06, 9:07, 9:13, 9:06, 9:20, 9:20, 9:16, 9:09, 9:25, 9:22. I reached the half marathon mark in 2:01:15. My first quarter of the race (1:00:30) and my second quarter (1:00:45) were almost exactly the same. I felt great. Heading out for the third loop and feeling strong. And even the conditions weren’t that bad. It was cold but not unbearably so; I actually unzipped my top layer on the third mile. It was sunny. The roads were mostly dry. There was some stiff wind, but only at certain points on the course. Then things started to unravel. In retrospect, I clearly had a plan that was too aggressive. I expected to feel tired during the race, and thought I could just slow down if I felt too fatigued. I didn’t anticipate the severe leg pain that was to come. Just after I finished my 14th mile, I started feeling small cramps in my calves. Nothing debilitating, but enough that I knew I needed to slow down and try to get them to go away. I immediately dropped my pace and did the next three miles in 10:09, 10:08 and 10:03. I still got the occasional calf twinge, but not very often. Going a bit slower but still feeling OK as I finish loop three. Then, during mile 18, my thighs started to get tight. By the end of the mile, they had seized up so badly that I had no choice but to slow to a walk. The only way I can think to describe it is that it felt like my thigh muscles were trying to strangle my knees. I walked for a quarter-mile, and the tightness subsided enough that I could start running again, slowly. But it was the beginning of the end. Mile 19 took me 13:24 to finish. That’s the last mile I have a split for because, to make matters worse, my Garmin stopped tracking distance at 19.04 miles. It didn’t affect my ability to finish the race, but it definitely threw me off a bit. The fourth loop ended around 20.6 miles, and I alternated walking and jogging for the last 1.5 miles. My parents had picked a spot near the turnaround to come out about when I should be approaching to take pictures and cheer me on. They knew something was wrong because it had taken me so much longer to finish the fourth loop than the first three. Struggling mightily as I finish the fourth loop. I had been running as I approached them, but then I walked through the water station and to the turnaround and back to them. As I passed them, my dad came with me to see how I was doing. I told him it wasn’t good and he kept going with me as I headed out for the final loop. We walked together for about three-quarters of a mile and when we got to the beginning of the main loop, I had to tell him to stop while I tried to stretch out my legs a bit. Seeing how much pain I was in, and that I couldn’t even keep up with him walking, he said he thought I should call it a day. I knew he was right, but it’s not easy to pull yourself off the course when you’ve worked for 20 weeks to reach this point. Ultimately, I decided that if I kept going, I risked seriously injuring myself, and I told him I was done. We walked back to the staging building, and I had a new problem. Since I had been slowing down significantly, I was suddenly very cold. That roughly one-mile walk – dejected, in pain and freezing – was one of the most unpleasant experiences I’ve ever had. The good news: They had cookies in the staging building. I may have had five or six, and I don’t regret it (I also had a banana and some orange juice). I slumped to the floor and leaned against a wall, texted my wife and posted the bad news on Facebook and Twitter. Well, my first attempt at a marathon was unsuccessful. Went out too fast and could barely walk by mile 21. Will try again in October. As disappointing as the DNF was, I tried to stay positive (and the comments from friends and family that came flooding in certainly helped). I went farther than I had ever gone before, I didn’t let stubbornness lead to injury, and I learned valuable lessons for my next marathon attempt. I don’t see Sunday’s race as a failure. If anything, it has made me even more determined. I’m going to run the Scotiabank Toronto Waterfront Marathon on Oct. 19. And this time, I’m going to finish. Ben is a husband, father, runner and editor in Rochester NY. He can be found on Twitter at @bjacobsroch.